News Archives | Lapolla Industries, Inc.
Mississauga, ON (January 7, 2018) – Icynene-Lapolla, the global supplier and manufacturer of high performance, energy efficient building envelope solutions, today announced it has named Doug Kramer its Chief Executive Officer. Kramer will also retain the title of President. Former CEO Mark Sarvary will become Executive Chairman and will remain actively involved in ensuring the company’s continued success. These changes are effective immediately. A veteran of the spray polyurethane foam industry, Doug Kramer founded Lapolla Industries in 2005 and led the company until its merger with Icynene, an effort which commenced in late 2017 and finalized in 2018. He has since served the combined company as President. “We recognized early on that the performance and loyalty attributed to both brands is exceptional, which informed our ultimate decision to keep both intact for our customers” said Doug Kramer CEO & president of Icynene-Lapolla. “We anticipate 2019 will be an incredible year for the company” he added. To learn more about Icynene-Lapolla and its complete product lines, visit www.Icynene.com and www.lapolla.com. Icynene-Lapolla is a leader of high performance building material innovations aimed at optimizing the building envelope and maximizing energy efficiency. Available in more than 31 countries, Icynene-Lapolla is a global manufacturer and supplier of spray polyurethane foam for insulation and roofing applications, as well as reflective roof coatings and equipment. Serving architects, builders, contractors and homeowners, Icynene-Lapolla’s solutions enhance residential and commercial structures, in both new and retrofit construction. Explore the Icynene product line at www.icynene.com and the Lapolla product line at www.lapolla.com. Winter is here—a little earlier than usual for some of us—and you might already feel the chill in your own home. If it’s your first winter in a new place, you’ll be experiencing how your home adjusts to colder temperatures for the first time. If you’ve lived with drafts for a while, it might be time to tackle the issue head-on. Pay attention to these typical signs that your home is poorly insulated and find out what to do about it as the thermometer starts its annual plunge. This is a good indicator of your energy use (or misuse), but first, you have to have a point of comparison. One way is to check your home’s energy bill history. Many energy providers have dashboards that allow you to track your energy consumption over time and compare it to previous seasons. Another big motivator is comparing your energy use to your neighbours who live in similar homes. A behavioural science study showed that nothing motivates homeowners to use less energy than knowing what their neighbours are doing to lower their energy costs. Your home should have even temperatures as you move through it, from room to room. If different rooms have starkly different temperatures, that’s a clear sign your home is poorly insulated. Your HVAC system with its return vents and ducts are a big part of enabling an even and comfortable environment, but insulation is also important because without it that expensive conditioned air will leak out of your home like it was never even there to begin with. During the winter months, drafts in certain areas of a home are caused by cool air entering around window frames and doorways. Windows are a source of 25 per cent of a home’s heat loss. Adding insulation will not only make your home feel less drafty, but it will also save money on energy bills. Spray foam insulation is the best choice for sealing and insulating cracks and crevices. Frozen pipes in your walls are also huge indicators that you have an insulation problem. Proper insulation protects your home from damage caused by our freezing temperatures. Poorly insulated exterior walls can cause frozen pipes, which can burst and cause thousands of dollars worth of damage. The walls, floors and ceilings of your home should feel warm and dry to the touch. When drywall and panelling inside a home feels damp or cold, that’s a clear sign there’s not enough insulation. Alternatively, when touching an exterior wall, it should feel cold because insulation is keeping warm air inside a home. A home can lose 35 per cent of its heat through the walls, so consider adding spray foam insulation to seamlessly seal walls right into the corners. Are some of your rooms inexplicably colder or hotter than others no matter what you do? If those rooms are well ventilated, then the problem is probably poor insulation. Heat and cool air can escape almost anywhere that doesn’t have insulation to stop its path. These rooms are often above the garage or below the attic where it can pay to add insulation. Get an expert to help you with a spray foam insulation audit. Water has a much easier time finding its way into a poorly-insulated home than a well-insulated one. If you’re experiencing a leaky attic, your insulation may be part of the problem. Water leaks around windows can also be a sign of poor insulation. Water damage can cause many costly problems down the road, including mould issues, so give leaks prompt attention. A sign of poor insulation in the depths of a cold winter are ice dams. Ice dams are a direct result of heat rising from your poorly-insulated home that melts the bottom layer of snow on your roof. The meltwater then trickles down towards your gutters and once it hits the colder air may begin to freeze. This can cause large chunks of ice and oversized icicles to form on the perimeter of your roof, called ice damming. Not only does it wreak havoc with your gutters and roof, but it also becomes a safety hazard for anything or anybody below—these icicles can grow to monumental sizes. The easiest way to tell if your house is well insulated is to have an experienced insulation expert out to inspect your floors, ceilings, and walls. Many insulation installers have access to specialized inspection equipment and some are happy to offer a free in-home inspection. Spray foam insulation is one of the best ways to save money on energy bills, since it is easy to install in an existing building and keeps a home warm in the winter and cool in the summer. Roughly 25 per cent of a home’s heat seeps out through the attic and roof, and another 35 per cent goes out the window. It’s definitely worth checking insulation levels to put some of those savings back in your wallet. Lapolla FOAM-LOK 2000 4G closed-cell spray foam manufactured by Icynene-Lapolla and featuring Honeywell’s Solstice Liquid Blowing Agent was installed to prevent lumber mill stoppages due to freezing. Watch the video below and learn more at: https://hwll.co/macyu. The need for energy efficient buildings is the largest driving factor behind product innovation and building science advancements in air barrier materials. However, other equally important aspects of modern construction are sometimes overlooked by building professionals. Manufacturers continue to improve their products to extend a building’s durability and lower the costs of construction. 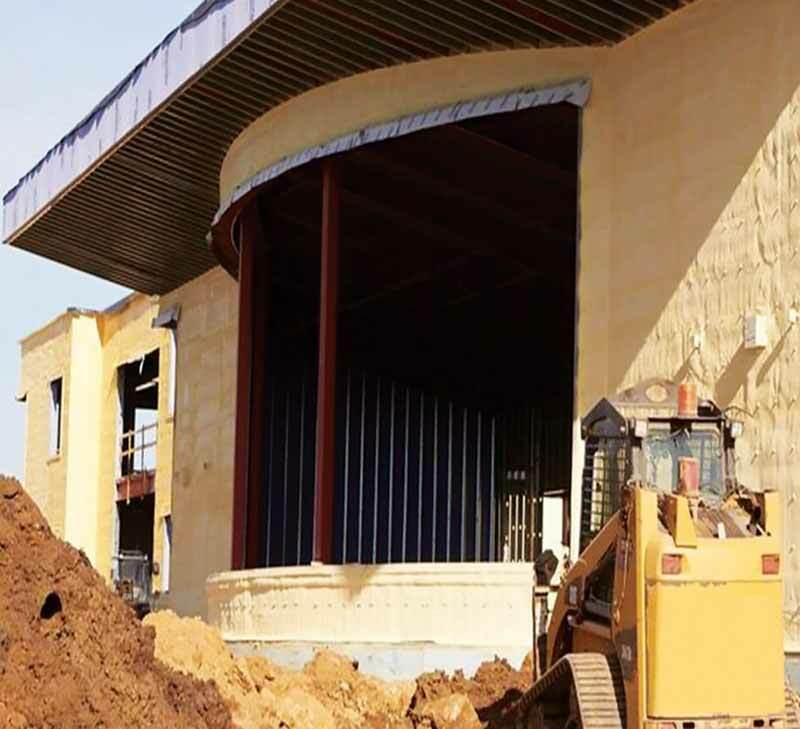 The developments in air barrier products over the years reflect a constant demand for airtight, mechanically ventilated buildings to meet ever-changing energy codes and expectations among builders and architects for higher performing facilities. There is also pressure to find ways to design a building that could function properly in any type of climate or environment. Therefore, understanding the progression of air barrier materials will help professionals at all levels of the building design process choose the best air barrier system for their project. The importance and inclusion of an air barrier material is not questioned by today’s builders and architects, but not long ago, a structure’s air barrier was not composed of one single membrane. With painstaking detailing of joints and transitions, interior gypsum was largely employed to reduce air leakage, knowing it had the help of other materials in the exterior wall for slowing down leakage. Since then, the function, design, and construction of an air barrier, not to mention how it is specified, has been constantly changing. It is important to remember how far the products and systems have come to fully appreciate and better understand how to utilize them in present day construction. Building wraps were among the early products to act as an exterior air barrier material and had the advantage of being vapor permeable. Even after the creation of the U.S. Department of Energy (DOE) in the late 1970s, there was still a lack of advanced science and consensus of where vapor retarders and insulation should go in an exterior wall. A “breathable” exterior wall (i.e. a wall with materials facilitating drying by air movement or vapor permeability) was thought to be the only way to prevent moisture damage. Building wraps could fit this design method by allowing vapor through the material but preventing the passage of liquid water and air. Installation of the wraps was the biggest challenge. They had to be fastened frequently and attached with precision. It was not uncommon to see wraps flapping in the wind on a construction site simply because it was not taped at the joints or attached to the building correctly. The product itself worked, but the method in which it needed to be attached and the lack of high-quality workmanship in installation led to the next generation of air barrier materials. When self-adhered membranes came into the market, they were instantly thought to be superior to wraps as they adhered to walls without the need of a fastening pattern. Some contained self-healing qualities and sealed screw penetrations or small slices made to the membrane during construction. While these products proved more reliable, the installation process was long and depended on temperature-sensitive adhesives. When these products were first introduced, there was a period of trial and error by manufacturers with adhesives—some work better in the heat, some in the cold, and very few work well in both. Dirty and dusty substrates also contribute to adhesive failure. The self-adhering membranes sometimes required a termination bar that had to be fastened down over the membrane edge as it was common for certain edges of the membranes to peel. Closed-cell spray foam insulation tackles design challenges and problem areas like oddly shaped structures and curves that are difficult or nearly impossible with other types of insulation. Originally, peel-and-stick membranes were vapor impermeable, but as the breathable exterior wall concept spread, manufacturers developed vapor permeable versions. This transformation required years of research and new technology to allow vapor through the adhesive and the facing of the membrane. Fluid/liquid-applied barriers were another jump in the air barrier product industry. The first versions could be spread by trowel and adhere in place on the wall, thereby becoming both the air and water barrier. Spray and roll-on versions were created as thinner applications but both thicknesses accomplished the same goal of being the air and water barrier. While self-adhering membranes evolved over time, the manufacturers of fluid-applied barriers learned from their predecessors, and soon had both vapor permeable and impermeable versions. Fluid-applied barriers are thought to have even less possibility for error in installation than self-adhered membranes. They can cover corners and angles better than self-adhered membranes, which take some skill to accomplish the tricky bends and folds. While this was a huge advancement and reduced the time of installation, in the author’s experience, the higher cost of these products often resulted in them being “value engineered” out of the project. A further advantage of fluid-applied barriers over self-adhered membranes is the lack of the membrane itself. Often, compatibility with various caulks and sealants must be tested not only with the adhesive, but also the membrane. Fluid-applied barriers are more often compatible with such construction materials and capable of being applied to them. A self-adhered membrane would have a very hard time transitioning and adhering to an irregular surface such as the face of closed-cell spray foam. Conversely, a fluid-applied product can fit into the irregularities of the surface and achieve a solid bond. In constantly wet climates, such as the State of Washington, caution must be taken with self-adhered membranes as their adhesive is typically sensitive to wet surfaces. Many fluid-applied barriers advertise their applicability while actively raining so work may continue. The ability to self-support and adhere to common construction materials, including itself, allows spray foam to be installed much more quickly than rigid foam board and it does not have any joints to treat. The changes and advancements in energy codes, specifically the 2009 International Energy Conservation Code (IECC), started to require exterior continuous insulation (ci) in most of the eight climate zones. Knowing vapor permeable air barrier membranes were the newest and fanciest product, and the exterior wall still needed ci, it was not uncommon to find both installed on the exterior side of the wall. If the ci was rigid foam plastic insulation and installed after the air barrier membrane, as it typically is, the vapor permeable properties of the membrane are rendered useless. A wall is only as breathable as its least breathable component and in this case, it is the vapor retarding rigid foam plastic insulation. This multilayered approach did not allow for vapor permeance to the exterior because the insulation was preventing it from exiting. While this is not necessarily a poor design, it just means the owner paid a premium for an individual air barrier product that is not being used to its full potential. It also means if the mechanical engineer was counting on a permeable exterior wall, some of the HVAC calculations may be off. Continuous insulation as an air and vapor barrier means the old practice of using interior vapor retarders is no longer necessary in cold climates, and this material can be removed from the assembly. Those vapor retarders were meant to keep warm, humid air from getting into the stud cavity and touching a cold surface. Continuous insulation reduces the chances of having a surface below dewpoint temperature inside the stud cavity and, along with the wall no longer being leaky, the humid air in the cavity will normalize with the interior and be part of the HVAC system’s conditioned air. If any moisture was to leak in the wall cavity, it would now dry to the interior. As architects and designers were learning the building science of why and how to use ci properly, they were also looking at the increasing cost and number of materials employed in the exterior wall. The need for one multipurpose product on the exterior wall created a business opportunity for rigid foam plastic manufacturers. Extruded polystyrene (XPS) and polyisocyanurate (polyiso) insulation manufacturers began to successfully test their products to show they could act as the air and water barrier, vapor retarder, and ci of the building. One product performing all these controls allows the removal of one or more materials from the assembly, such as the individual air barrier, saving installation time and money. Closed-cell polyurethane spray foam insulation installed on top of a self-adhered membrane. To accomplish this level of performance, rigid boards need to be mechanically fastened to the walls to resist negative wind pressure. They must also seal every board joint and fastener and through-wall penetrations. Typically, tape is employed to seal the board joints and fasteners, while flashing is used for through-wall penetrating objects. If installed correctly, tape can be effective, but the thousands of foam board joints and tens of thousands of foam board fasteners create potential direct paths for leakage. If the rigid foam board is used as the air and water barrier, it is imperative every joint and fastener treatment be installed correctly. Closed-cell polyurethane spray foam has recently been approved as an exterior air, water, and vapor barrier. Additionally, spray foam does not have any joints or fasteners to seal. Rigid polyiso foam plastic insulation and closed-cell polyurethane spray foam have similar performance characteristics. They each have a closed-cell structure that can utilize a blowing agent to achieve some of the highest R-values per inch on the market. Spray foam tops the insulation R-value charts at around R-7.1 per inch. They both perform as an air, water, and vapor barrier. However, spray foam is installed very differently. It is sprayed onto the exterior sheathing (or masonry back up wall), adhering to the surface, and expanding outward to create the desired thickness. Spray foam will self-support and adhere to common construction materials, including itself. This ability allows spray foam to be installed much more quickly than rigid foam board and it does not have any joints to treat. Spray foam can also allow for eye-catching architectural curves in walls to be insulated and sealed easily whereas rigid foam board would require thin vertical strips to make it around the radius. 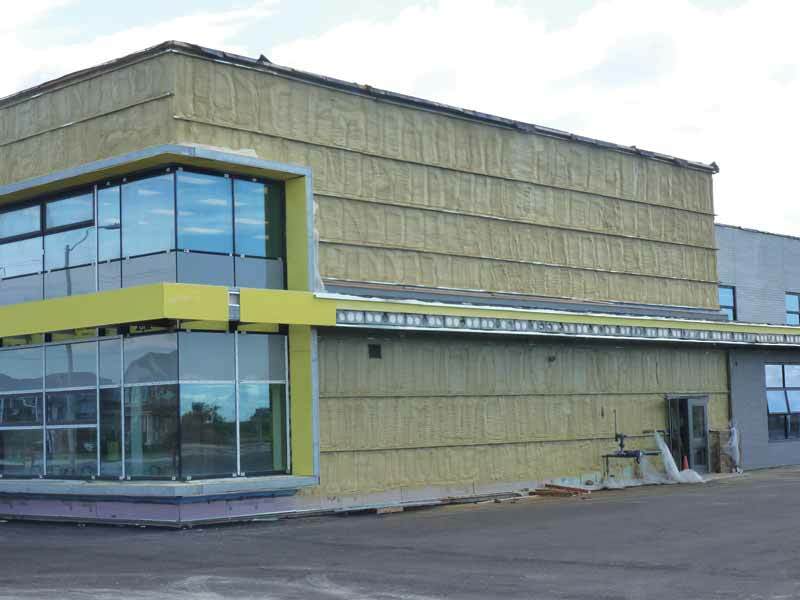 Spray foam insulation helps expand the horizon of design opportunities for commercial architects beyond what was feasible with fibrous or rigid board insulation options. Architects can allow their creativity to show with the confidence spray foam will help meet the energy efficiency, overall performance, and functional needs of a building. Closed-cell spray foam insulation tackles design challenges and problem areas that are difficult or nearly impossible with other types of insulation, including arches, curves, cathedral ceilings, and transitions from the exterior wall to fluted roof deck over hangs. 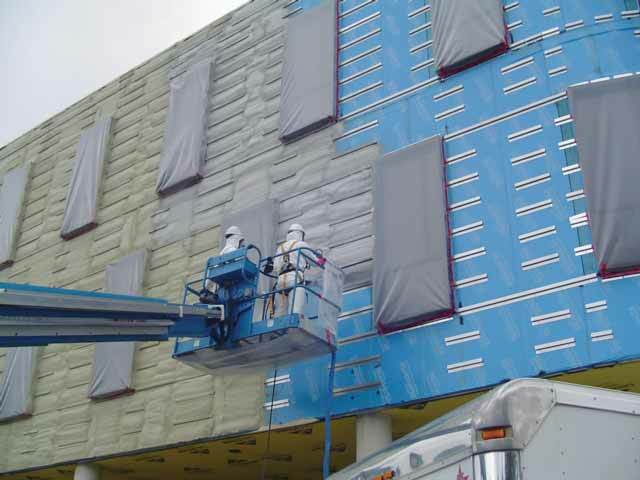 Air barriers have evolved from encompassing several different materials with labor-intensive processes to single, multipurpose products making construction faster and more cost efficient when combined with the right design and building science. Read the full article on http://torontostoreys.com/2018/11/winter-insulation/. Icynene-Lapolla, a supplier and manufacturer of energy efficient building envelope solutions has announced it will expand distribution of its Lapolla building materials line in Canada. The five-story brick and glass structure at 122 S. Main St. in Harrisonburg, Virginia, has more than just an address. It has a name and history steeped in tradition. Listed on the National Register of Historic Places, the Keezell Building sits in the city’s downtown area, and is a proud example of classic revival-style architecture. Just after being built, it housed the Daily News Record offices, printing presses, and was named after the paper inhabiting it, being touted as one of the finest and most modern newspaper buildings in Virginia. Read full article here (opens PDF). https://lapolla.com/wp-content/uploads/2018/03/NEW-Tax-Benefit-for-Commercial-Roofs.jpg 384 1030 Lapolla https://lapolla.com/wp-content/uploads/2015/12/lapolla-industries-spray-foam-cool-roof-supplier-logo-218x100.png Lapolla2018-09-11 12:07:162018-09-11 13:17:15NEW Tax Benefit for Commercial Roofs!